Discussion in 'Science and Pseudoscience' started by Spiemel, Apr 16, 2016.
Who else is sceptical about the self-filling water bottle that a company named Fontus has been trying to bring to market since 2014? 1) Peltier devices are not efficient and are also used in dehumidifiers. To extract 1l of water per hour could take anywhere from 300-500W of power. This site measured commercial dehumidifiers and median efficiency is about 1.62L per KWh. The Fontus company claims anywhere between 0,5L and 0,8L per hour. That means that if they use a median Peltier that takes about 300W (for 0,5L) to 500W for 0,8L. The most efficient Peltiers according to the site is 3.56L/KWh. So that would still require 225W per hour. 2) The solar panel of the Aero is small, looks about 1sqfoot. Worst is that they don't even bother flattening it out, just letting it be curved which is horrible to capture sun properly. Average solar efficiency from the following site claims 1sqfoot max output (assuming ideal sun and angle) is about 20W. B) Fontus made a solar panel 10times more efficient than is average for solar panels. If A is true, why are they making water bottles and trying to collect a couple of 100K of crowd funding, when they can sell this technology to governments and agriculture companies for millions. Why, because those governments and companies would want to see working prototypes and it opens them to legal claims when they don't deliver. I don't count some government stipends or funds they received because some government agency got duped into giving them some money to investigate the possibilities. If B is true, why are they making water bottles and trying to collect a couple of 100K of crowd funding, when they can sell solar panels in a multi-billion dollaar market and totally revolutionise the Renewable industry? I am sure someone who understands the physics can make actual energy requirements for condensing water etc. PS: I haven't even started about the Fontus 'Ryde' version yet, which you connect to your bike. That thing has a solar panel surface about 1/10th the size of the Aero, so the math there is near impossible. Who else thinks all the following 'tech' and 'science' sites are doing the public a disservice by reporting on it and thinks Indiegogo should pull this campaign asap? If you are an adventurer, you know the anxiety that comes with running out of water in the middle of a tour, the last thing you want is dehydration when you are miles away from home! 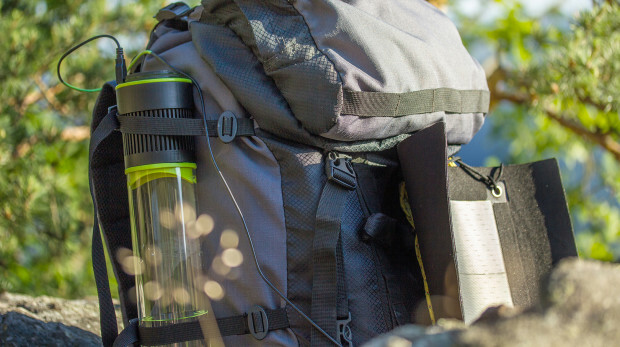 Fontus is a self filling water bottle that allows you to plan your adventures without having to worry about heavy water loads or where to find the next river or gas station to get your water supply. Fontus will set your mind at ease and might even save your life! It will keep you hydrated during your travels and ready for improvisation! We are a small start-up with a big vision! By participating in this crowdfunding, you are helping us to finalize the development phase and run product and water analysis testing so that we can reduce the time needed to get from development to full scale production. We are planning to increase new application specific products and scale up this technology into larger platforms that will be able to solve larger problems on our planet. It is our future intention to deploy our products to regions with water scarcity, offering solutions that have the potential to improve or even save life. However, to get there we must start here. We thank you for your kind support! Fontus Airo will save you trouble, weight and might even save your life! 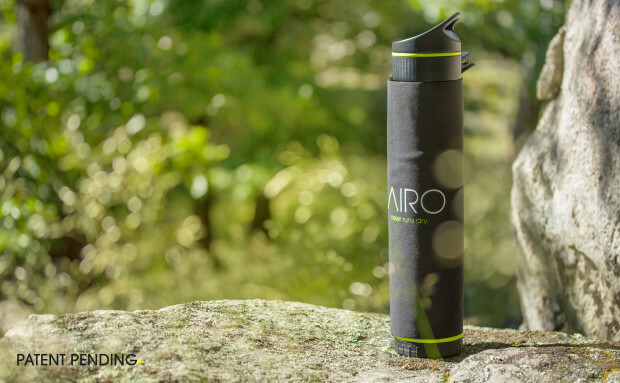 This water bottle will refill itself while you are hiking, sailing, climbing, camping or just enjoyign nature.There is no need to worry any more about heavy water loads, plastic bottle waste or where to find the next river to fill up your bottle and get your daily water supply. This device gives you the freedom to plan your adventure without worriyng about the most elemental component of survival: water supply. 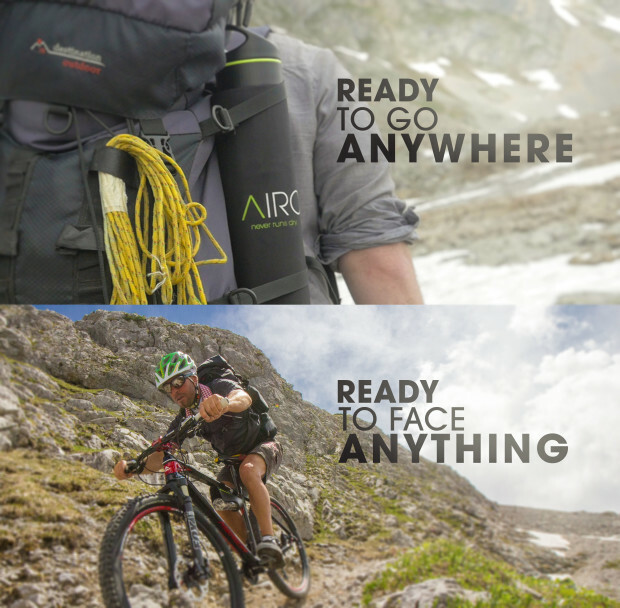 You can clip the Airo to a backpack and fill your bottle while you are hiking. Allow it to function while you are in motion, or just let it fill while sitting at a campsite! Light: Forget about carrying heavy water loads! This device was designed to capture the moisture contented in the air, condense it and store it as safe drinking water. 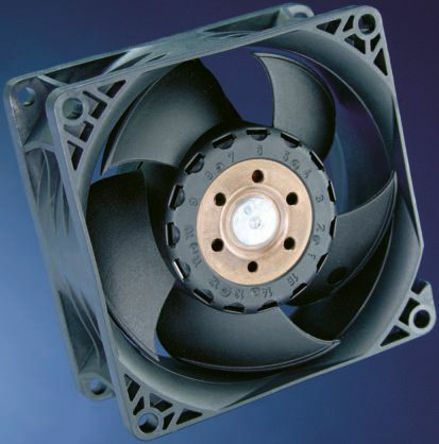 A small fan draws the air from the surrounding environment, runs it through a special filter and presses it into the condensation chambers. A series of small coolers bring the moisture contained in the air to condense on special surfaces. The resultant liquid water then drops into the bottle´s main body and is stored. Should you have concerns about still or stilled water, the lower section of the bottle is designed to carry little capsules, which dissolved in the harvested water, iniciate a process of re-mineralization. This process makes it possible to produce fresh mineral water and give your body everything it needs! We believe it is easier to add vitamins and minerals specific to your needs into the water, rather than worry about what might already be in there waiting for you! BY GETTING THE AIRO at the $225 LEVEL, YOU GET A SPECIAL LIMITED EDITION VERSION with special graphics and a note from the founders. 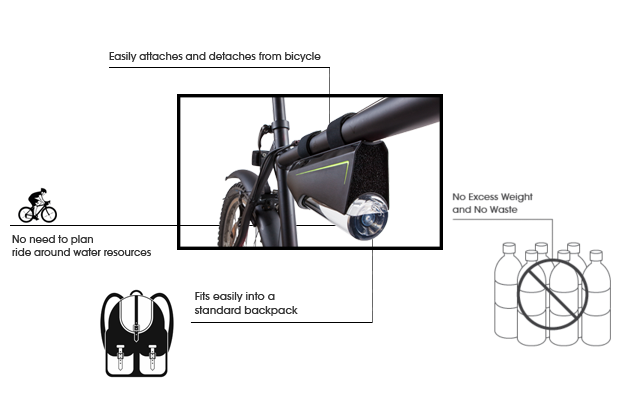 Fontus Ryde is a self filling water bottle, especially designed to fit your bicycle! 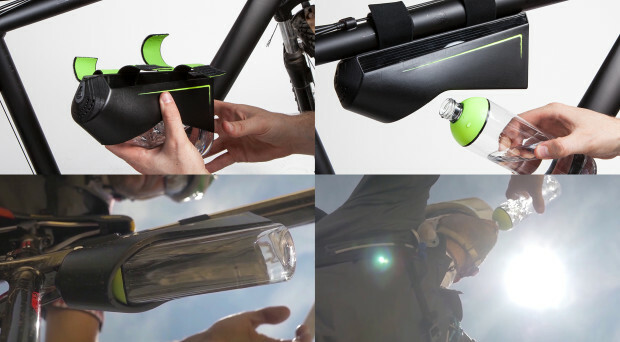 This water bottle will refill itself as you ride on your bike. 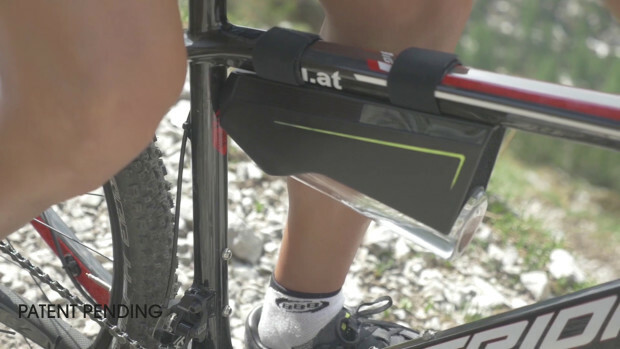 Its adapted design fits the ergonomics of your bike adopting the shape of a bottle holder. Harvest water while you are on your bike tour and stay regularly hydrated! This bottle uses the air stream you create while riding in order to press humid air into the system. The air stream you generate while riding is used here in place of a fan to press large ammounts of air into the chambers without needing extra energy sources. It also supports the performance of small coolers at the heart of the device. The air first runs through a special filter and is then pressed into the condensation chambers. The air is then condensed across a complex cooling subassembly. 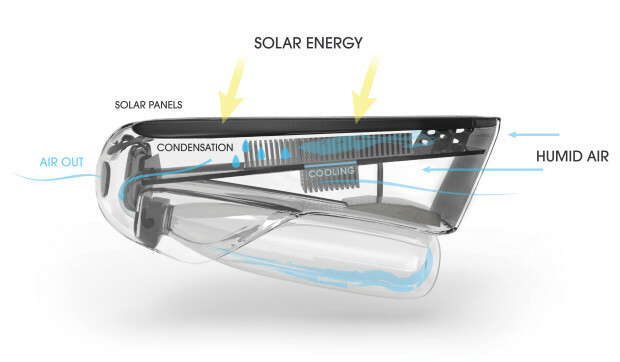 A series of small coolers powered by solar panels, attached at the sides, bring the moisture contained in the turbulent air to condense on special surfaces. Liquid water then drops into the bottle´s main body and is stored. This water can then be re-mineralized using special capsules. BY GETTING THE RYDE at the $225 LEVEL, YOU GET A SPECIAL LIMITED EDITION VERSION with special graphics and a note from the founders. Harvesting water from the air is a method that has been practiced for more than 2000 years. The Earth's atmosphere contains constantly around 13.000 km3 of mostly unexploited freshwater. This project is an attempt to discover these resources. We all know the basics of extracting water out of the atmosphere: when we take a cold soda can out of the fridge in summer and little droplets form on the walls, making it look even fresher and us thirstier! A surface that has a lower temperature than the atmosphere makes the humidity, contained in gas form in the air, condense and change into a liquid state. At this point little drops of pure water form. When changing states, water, loses almost all additional elements it could have been combined with. This could be dust, minerals or bacteria. Fontus aims to bring an alternative way of collecting safe drinking water to regions where drought and unclean water are a big issue. Bikes, as the most widespread means of transport in the world, especially in developing countries, seemed at the first brainstorming stages to be the perfect vehicles to combine with the invention. Fontus Ryde and Airo might be a clever way of acquiring freshwater in regions of the world where groundwater is scarce but air humidity is high. They could work as a mobile water well, for example, providing a child with water for the day while riding to school, or providing essential water supplies during a longer camping trip. The efficiency of the fontus bottles depends mainly upon the relative humidity of the air and the temperature. The higher the humidity and the temperature, the faster will the bottles fill themselves up.We cannot guarantee that Fontus will deliver a constant water output in all conditions and may produce little or no water at all under some conditions. The basic principles of the Fontus technology - atmospheric water generation through condensation - have been proven and tested in monitored conditions. With your support we will be able to enter into a higher development phase, optimize efficiency, refine the design and provide test data. 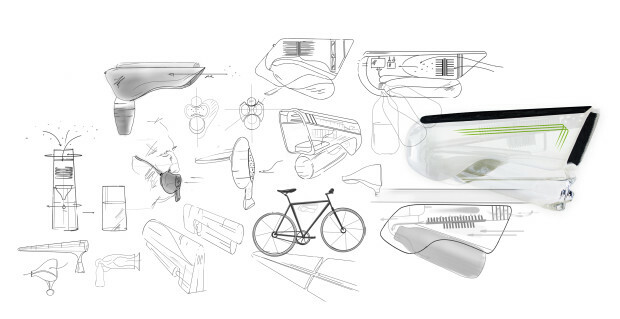 After the successful completion of the expected design goal, we plan to integrate the technology into Fontus Airo and Ryde devices and validate the products with customers around the globe in real world conditions. We want to specifically point out that all graphics, images and videos serve for illustrative purposes only and do not represent detailed or accurate data product results. As we are unsure of the total product quantity to be ordered, we want to leave ourselves some room to meet the market demand. However, we will make every attempt to accelerate the time line as much as possible and be communicating with all of our first adopters by frequent progress updates as we move along each of the milestones. 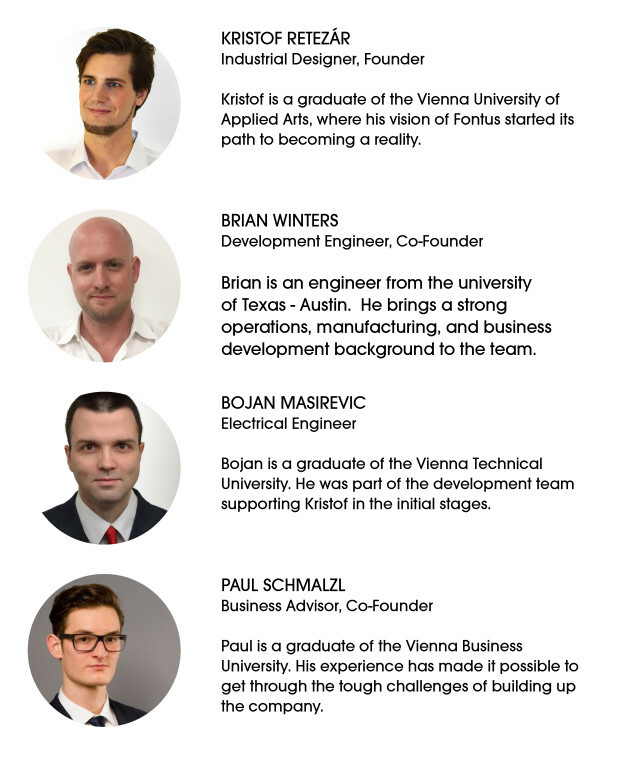 Fontus is a young company in the start–up phase with its headquarters located in Vienna and a development site located in California. We are a motivated team composed of young members of different countries and disciplines such as industrial design, electrical and mechanical engineering, product development and international business operations. 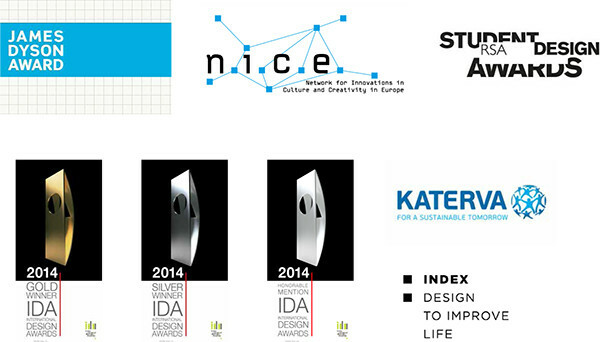 Our work has immediately attracted local and international recognition and has been appreciated through numerous design awards. In 2016, the Fontus project received financial support from the austrian government (AWS). Humbled by the enormous email inquiries and honored letters of support and encouragement, we are committed to bring our ideas to life and ready to face new challenges! Thanks for your kind support! How come international shipping is $75? 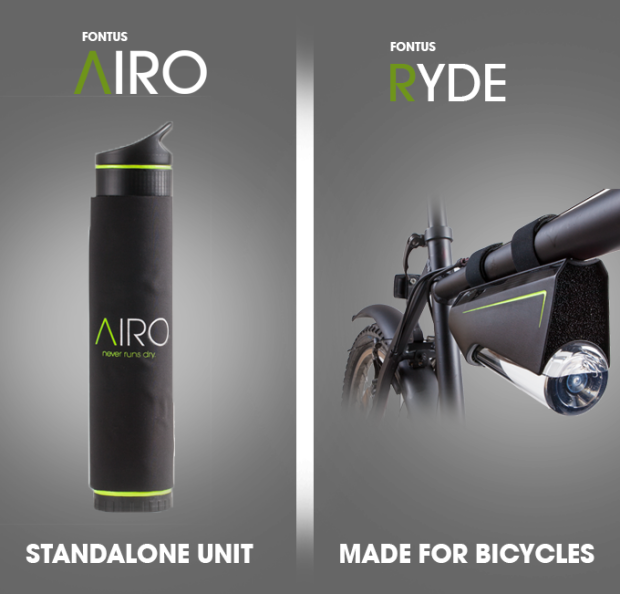 The FONTUS bottles, both AIRO and RYDE are being shipped from the United States as an origin point. We have done everything we can to absorb as much of the shipping costs as possible. 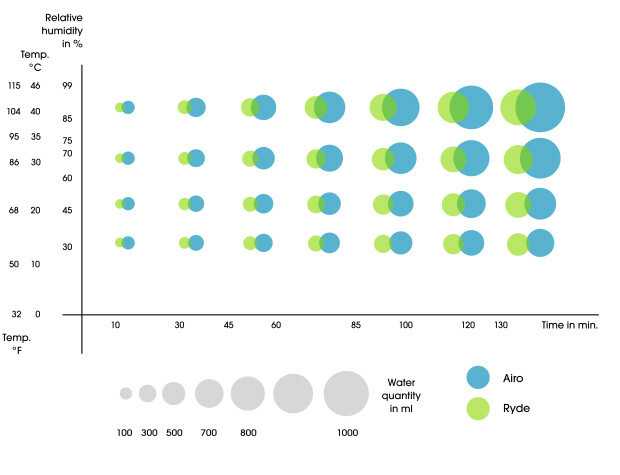 How much water do the bottles produce? As humidity and temperature varies around the globe, we cannot guarantee an equal water output in all regions of the world. After final prototyping we plan to test the product under varying conditions that will encompass the different climates of the world and we will be able to provide you with test data on regional differences of water output. You can see our first estimation of effectiveness of Fontus in the info graphic above. Isn’t distilled (or still) water unhealthy? There is much confusion around this topic. The water you harvest with the Fontus bottles is not distilled water, it has been condensed out of the atmosphere. Civilizations have been using a form of this technology for many years, we are just rebooting and modernizing it based on current technology to help more people. We believe that it is much easier to add in the vitamins and minerals you need into a clean water supply, rather than of worry about unknown potential chemicals and harmful agents that could already be in the local water source. Is the harvested water polluted? Atmospheric water is clean and does not contain harmful micro-organisms. The process of evaporating water and condensing it back is already itself a purifying process. This means, the water harvested by the Fontus bottles is already water in one of its purest states. However, Fontus was not designed to be used in urban and highly polluted areas. Currently the filters we have in place were designed to maximize airflow to the unit; so closer to IP54. Due to the overwhelming response we will be looking at the inclusion of an air, and if needed water filters for future models. What is the current status of technical development? The basic principles of the Fontus technology - atmospheric water generation through condensation - have been proven and tested in monitored conditions. With your support we will be able to enter into a higher development phase, optimize efficiency, refine the design and provide test data. After the successful completion of the expected design goal, we plan to integrate the technology into Fontus Airo and Ryde devices and validate the products with customers around the globe in real world conditions. How does the technology it work? We employ a technology that has been around for many generations that generates a condensed water molecule out of the air moisture. There are many companies that already offer a larger version of this technology. However we have focused on creating a smaller and more efficient version of the technology to allow for portable and personal use. We will not disclose any subsequent details as to the absolute specifics of how it functions. Can it be cheaper in the future to help with humanitarian missions? Yes, the intent of this project is to help generate the funding needed to finish the test validation and generate the component tooling to create a final version that is able to support more humanitarian aid missions. Our vision is to expand our product family and applications and focus on regions with water scarcity in the future. Why can't I select the color/size combination I want? Currently we are only offering what you see available online. However if you are signed up to the newsletter, you will be the first to know about the customization of products when that option becomes available. It is explicitly pointed out that the products which serve as Perks are in the development phase. It cannot be excluded that during the development phase technical, economical or other circumstances arise which may result in (i) a delay of the delivery of the Perk or (ii) the production and delivery of the Perk in a different form as regards functionality and/or design or (iii) even non-production of the Perk. In the latter case there will be no Perk delivered to the Contributor. Contributions will not be refunded. By making a Contribution the Contributors explicitly acknowledge the risks associated with the occurrence of one of the aforementioned events. Please follow Fontus on Social Media for all the latest updates. 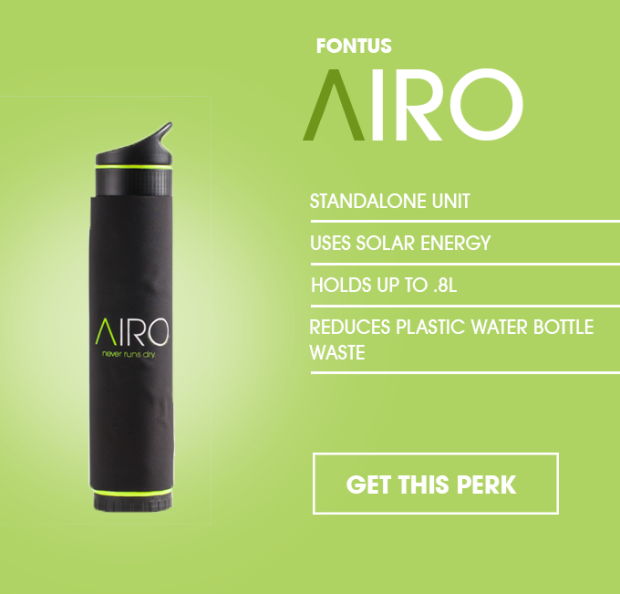 FONTUS AIRO AT THE NORMAL PERK LEVEL - GET 1 FONTUS AIRO - Be a part of history by owning the world's first self-filling water bottle! Be listed on the thank you page of our website! Every dollar counts toward affecting real world change. GET 1 FONTUS RYDE AT A SPECIAL EARLY BIRD DISCOUNT - Be a part of history by owning the world's first self-filling water bottle made for bicycles! 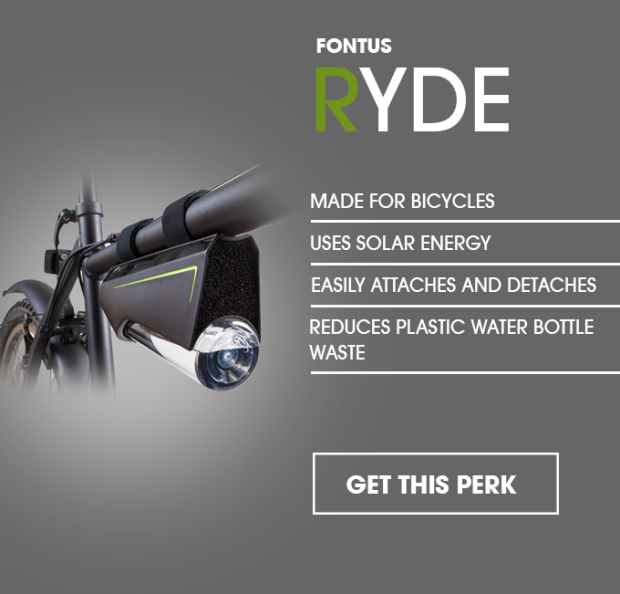 FONTUS RYDE AT THE NORMAL PERK LEVEL - GET 1 FONTUS RYDE - Be a part of history by owning the world's first self-filling water bottle made for bicycles! GET 2 FONTUS AIROS - at a special combined rate to save on shipping! Be a part of history by owning two of the world's first self-filling water bottles! 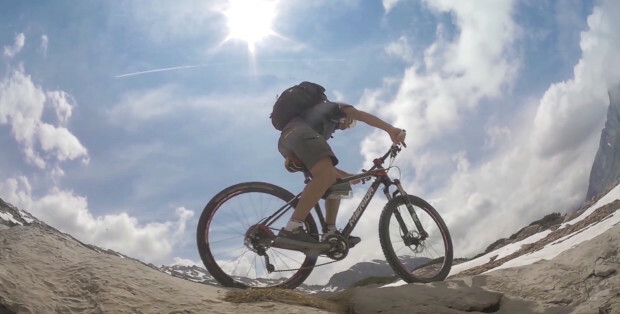 GET 1 FONTUS AIRO + 1 FONTUS RYDE - Be the ultimate adventurer by owning the world's first self-filling water bottle and the world's first self-filling water bottle made for bicycles! 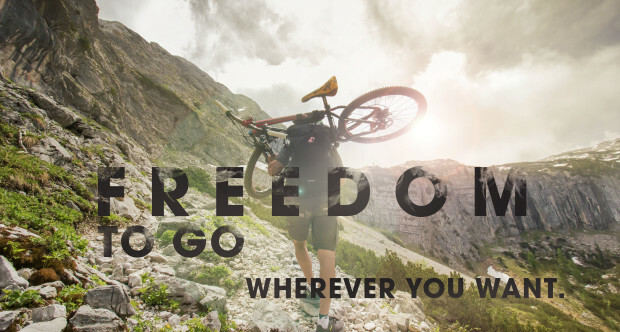 GET 2 FONTUS AIROS + 1 FONTUS RYDE - Show that you're a true explorer by owning a winning combination of the world's first self-filling water bottle and the world's first self-filling water bottle made for bicycles! GET 4 FONTUS AIROS - at a special combined rate to save on shipping! 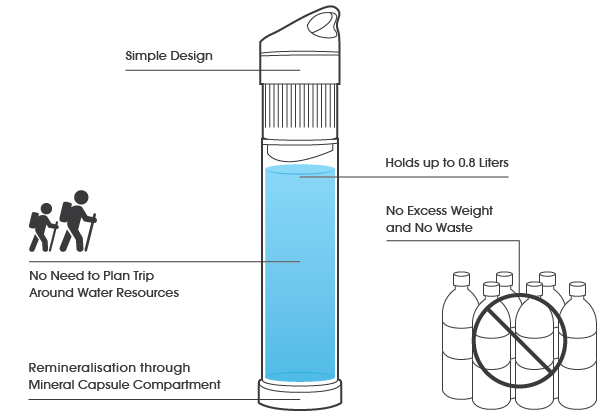 Be a part of history by owning four of the world's first self-filling water bottles! Do you think this campaign contains prohibited content? Let us know. for Fontus - The Self Filling Water Bottles and the team! Essentially they are claiming increased efficiency sometime in the future. They don't actually claim to have this technology, but claim to be hopeful about developing it by November. The solar cell unit used in this system has a 12 V rating output voltage with the maximum output power of 120 W, which is able to supply enough power for three 40W Pelrier coolers connected in parallel. Each Peltier cooler has a dimension of 4x4x0.8 cm, maximum current of 3.6 A and the maximum temperature difference T of 87°C. The heat sink for each Peltier element is made of aluminum alloy and has a dimension of 15x15 cm making the total heat exchange area to be 45x15 cm on each side of the Peltier elements. The air is pumped into the system using a 6000rpm, 15x15cm, 12 V fan that capable producing airflow of 500 cfm. Applying this system in a high humidity region such as Yanbu produced almost 1 Litre of condensed water per hour during the day light, which is a promising result for a more sophisticated system that encounter higher power solar cells and facility to store the excessive energy during the day light to be used at night, which we are currently working on. So comparing their system to Atta's (which claims to get 1L/hour in ideal conditions, like they do). It uses three Peltiers, with three fans. So the idea of shoehorning that into the top of a water bottle is, at best, insanely optimistic. Yup, and let's not forget that the Atta reference device uses a full scale solar panel to achieve that, not a flexible solar panel that is probably 9 times or so smaller than a regular solar panel. 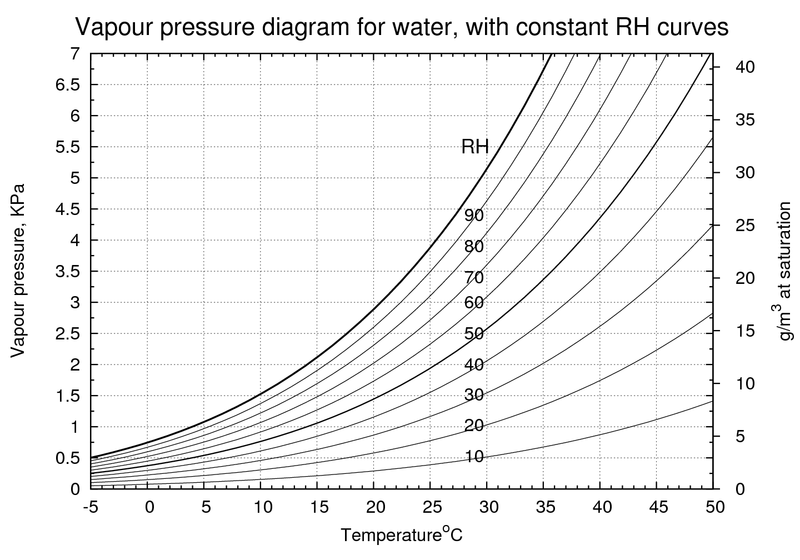 For example, according to this graph for the Airo bottle, after 120 minutes you get ~900 ml of water at the humidity of some ~90% air humidity and the air temperature of ~40°C, 800 ml at ~70%/32°C, 700 ml at ~50%/20°C, and 500 ml at ~30%/12°C. 800 ml is 89% of the maximum 900 ml, 700 ml = 78%, and 500 ml = 56% of the 900 ml. You can see how much water would condensate at certain temperature change. So for example at 30% and 12°C Fontus Airo is supposed to harvest 500 ml of water withing 120 minutes. At 30%/12°C air contains ~3g of H₂O per meter cube of air. It means you would have to extract 100% of the water (which is clearly practically impossible) from minimally 167 m³ of air (83.5 m³/h). In the same time you can see in the diagram also that if you dropped the air temperature at those 30% from 12°C to 0°C, only a bit above 1g of water would condensate. You would have to chill the air to deep cryogenic temperatures to harvest closer to the 3g of water vapor contained in it. So in fact the efficiency in the above chart would not be 6% at 30%/12°C, but rather only ~2% in ideal case. It also tells us that at this conditions, and with the condenser cooling the air by 10°C, you would need the air flow of approximately three times higher to get to the same harvesting volume. So instead of 83 m³/h, you would need to circulate minimally 250 m³/h of air through the condenser (assuming its 100% efficiency). That's already a hell of an air flow for such a small device. The flask has the diameter around 8 cm in their photos (smaller than a palm), and that corresponds exactly to the diameter of desktop computer fans. They usually have the maximum air flow of 25-50m³/h at full power. I found one that has the air flow of 190 m³/h (see below), but it consumes 25W! And that's the consumption for the air ventilation only, the cooling of this volume of air would require several orders of magnitude more energy. So no, even if you ignore the energetic needs of the cooling, it is physically excluded that the device could work as advertised. That is a great angle on the debunk: how much air is needed to extract the advertised amount of water per unit of time. It reminds me of the debunk on this site of the Triton Artificial gills which calculated the amount of water needed to pass through that scam device in order to make it possible for a human to breath. In one of their campaign videos they say (at 0:38) that they have a prototype that produces 17 oz (about 0.5 liter) water an hour. But do they say how big it is, or how big the solar cell is? this is from 2014 I hope it helps. the picture is from the huffington article. Retezár claims that in hot and humid weather, in which the product works best, Fontus can produce 0.5 liters of water in an hour. The system starts to work well, he said, when temperatures hit 20 degrees Celsius (or about 68 degrees Fahrenheit) and humidity gets to 50 percent. At that point, the product produces about a drop of water a minute. You’ll need to bike for a while to fill up the bottle. Those conditions aren’t easy to find in Vienna. So to test the system, Retezár simulated different atmospheric conditions in his bathroom. A drop of water per minute does not equate to 0.5 liters of water per hour (60 minutes). The largest usage of "drop" is 0.1 ml, so you'd need 5,000 large drops to make 0.5 liters. At one drop a minute that would take 83 hours to fill. The photo does not prove anything, and the articles contain the same bunk as their IGG campaign. If they can extract 0.5 L of water per hour with a computer fan powered by an AA cell battery, and a Coke bottle, they would better sell dehumidifiers - at this performance they cost hundreds of dollars, and consume hundreds of watts. I conducted a series of experiments trying to identify the ideal conditions, materials and cooling systems. I simulated different climatic conditions in my bathroom, modifying the air temperature and humidity. After more than 30 experiments, I finally achieved a constant drop-flow of one drop of condensed water per minute. One drop per minute really sounds about right for a home-made system. I wonder if somehow he thought this actually was 0.5L per hour? Of did he mean one drop per second? Of course there are no videos of it actually dripping at any rate at all. This summer, I joined a team of mechanical engineering students (Max Reese, Lalo Melendez and Andy Ly) tasked with designing and building a device that would capture water suspended in the air (humidity) and use it for irrigation in remote locations. 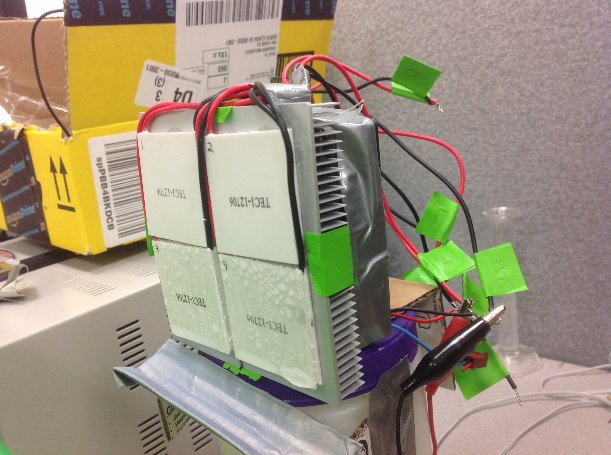 In the Latimer Energy Lab on campus, we made our first model using a Peltier cooler (it uses semiconductors to make one side of a ceramic square hot and the other side cold when an electrical current is added) and...it actually worked! Within a few minutes of running, the cold side of the Peltier chip was covered in condensation and within an hour it began to drip off. We were making water from air! Alchemy! After weeks of iteration, however, we were able to obtain only 1.3 mL of water per hour in our best iteration. Given that our target was a liter per day, some significant rethinking was needed. Next we tried using desiccants, calcium chloride in our case. Within a couple weeks we were using these hydrophilic salts to gather water vapor from the air, re-evaporate it with sunlight, and collect the moisture in a makeshift solar still. On our final day of testing we collected ⅓ of a liter with only a 12-volt computer fan powered by a small solar panel. Given the low relative humidity here in sunny and dry California, we were very proud of our device’s efficiency. We hope to improve it further throughout the coming year and work toward its implementation in the field. So the basic setup as shown in the photo (basically what is claimed to be shoehorned into the Fontus bottle) gets only 1.3 mL per hour, probably around a drop per minute. Clearly this is a "simulation" of their claims. They say they have not actually made anything that will do this yet. And the solar panel is in the shade. I would suggest they are filling a dripper manually between timelapse shots. Do they ever make that clear though? It seems like they strongly suggest it is real - they certainly seem to want people to get that impression. A drop of water per minute does not equate to 0.5 liters of water per hour (60 minutes). Retezár claims that in hot and humid weather, in which the product works best, Fontus can produce 0.5 liters of water in an hour. The system starts to work well, he said, when temperatures hit 20 degrees Celsius (or about 68 degrees Fahrenheit) and humidity gets to 50 percent. At that point, the product produces about a drop of water a minute. "+Mark Hupp We are developing an innovative concept that uses low energy levels and extracts air moisture through various different methods, not just cooling. Dont get confused by the simpified graphics of the video which only serve to illustrate the basic principle! The data regarding the quantity you can harvest with the devices is only based on first estimations and represents best possible conditions (90% humidity, etc) Final developmant stages and testing are still missing and that is what we are reising funds for!" I am starting to think they don't understand basic physics or heat transfer. over the past 8 months I have been working on solar distillation as a capstone project for a degree in mechanical engineering. I don't know everything about solar distillation, but I know enough to spot someone who knows very little. The biggest issue that my team has had is the fact that the latent heat of water is around 2250 kj/kg that is a fact that cannot be changed unless you begin to vary pressures. from what I have seen, there device does not have a compressor associated with it, so their stuck with the 2250kj/kg issue. for comparison with our design we are expecting to produce around 2L a day with a 1m^2 foot print, we are taking a different route though using concentrating a mirror and cooling. It looks to me they either have no idea of whats going on, or they just want to raise funds and not deliver an end product a year from now. regarding the relative humidity or %50 at 20 deg c the moisture content would be around 0.0075 kgwater/kgair. meaning it would be have to completely dry out 108m^3 of air. at %90 and 20 deg c moisture content woud be aroung 0.0135kgw/kga, and would need an air volume of about 60m^3. the number just don't work out. by the way this is my first go round, so I am unfamiliar on how you guys operate. Im just really pissed they are hosing a bunch of people out of money. ... "Final developmant stages and testing are still missing and that is what we are reising funds for!" If the funds are for the final development stages and testing, how can they also promise to deliver the products (perks) to the backers using the same money? Did they just confirmed to you that they are not intending to deliver the products to their backers? It's a 70 pint dehumidifier, meaning it can remove up to 70 pints (~33L or 8.75 gallons) of water every day, or 1.4L every hour (best case scenario). It is a 11.6 x 15 x 24.4 inches product, weighting 47 pounds. It costs $259 at Amazon. It consumes ~700W/h. Fontus claims is can remove up to 25 pints of water everyday or 0.5 every hour. Taking only the top part of the product that would produce water, it is a 6 (diameter) x 10 inches, or about 7% of the size of the Frigidaire dehumidifier. It will cost $250 more or less. It will consume 20W/h. Isn't there anyone here that want to tackle this second scam? here is a link to the comment. They won't confirm that right now yet of course, they need the funds to be disbursed in less than 2 weeks time first and then 'investigate' for at least a couple of months. It seems they don't understand basic Patent concepts either: you either make it public and claim ownership through a patent, or you keep things secret; you can't have BOTH. Of course, they don't state anywhere what their patent is about. A patent for a superefficient bendable solar panel would certainly qualify to back their claims, or a patent for a new efficient thermoelectric heat/cooling device, or even a patent for some new material that can 'catalyse' (I use that term in a broad also non-chemical way) the produce waterflow as claimed. But for all we know they patented how their lid screws on securely which won't contribute to the primary purpose of the bottle at all. My suspicion is this: they have not filed a patent at all, it simply is stated on their timeline to make it sound cool and legit, but this might be one of the strongest 'soft' Achilles heels of their campaign (the hard ones being available water in air for extraction and the energetic needs): if it can be forced out of them they lied about filing a patent, it is a clear red flag for IGG to have to act. Up until that point, we can go through all the science and give that to IGG, but they won't do anything because for IGG, any science arguments still leaves them too much room too wiggle room unfortunately (take a queue from evolution deniers for example). I am considering donating 25USD just to post a comment on their campaign asking what their patent number is in which country so we can look it up or force from them that they have not filed a patent and have to correct their timeline, which will be the red flag we need to conclusively move these guys from the category of 'clueless-but-well-intending', to 'frauds'. Yes, you can donate even as few as $1 for commenting, but it is better to donate more, and pretend to be veritably interested. You can always safely and instantly withdraw your donation through the user control panel at any point before the end of the campaign (don't do it immediately after posting your question, though - the question would disappear too). There have been some interesting things going on in their comment section. People are really pissed about them adjusting their prices, and it is becoming apparent they have not thought the product development through. they are just trying to stay alive until the campaign is over. You know what no one likes? Getting an email about how a product is cheaper now then when they purchased it. As an early backer of the Fontus AIRO I feel cheated that I’m left out of the Earth Day $190 special. We are encourageing here people to support us financially in order to make this dream come true. This is not an online-shop at all, so no need to feel cheated or offended by changes in our prices. We apologize for everyone that feels this way! If your intention is not alligned with what we are looking for on this plattform, I would ask you to just wait 2-3 years until the products are on the market." You aren’t exactly left out. You can get a refund and then get the earth day special. That is what I did. Saved $35. Of course you are welcome to do that! Our intention with the earth day perk was to generate a spontaneous possibility for those who can´t afford the normal perk price. This need emerged as we moved forward with the campaign and got lots of emails of peolple of Asia and Latin Amerika saying that they cant afford it. If you read through our site, we are encourageing here people to support us financially in order to make this dream come true. This is not an online shop." They are just telling people anything they can to stay afloat. on the technical side. there is this. Can I use another (more powerfull -20 w) solar panel To produce Walter faster? Definitely! You can connect your bottle with any power source through the USB connection." A 20w panel hooked up through a USB socket? I mean, sure, technically it's physically possible, the conductors in there can handle a lot more than that, but I don't think any responsible manufacturer is going to make a kit that puts that kind of wattage through a USB port when the specifications limit port draw to 900 mA at 5v (i.e. 4.5w). All something more powerful would be good for is damaging people's devices. There's a reason why most kits have a separate part for USB hookups and not straight off the panel. I will say this one is a "better" scam than the Triton guys. There's an old trick for fake inventors scamming more traditional investors: Claiming to already have an invention you then can't actually produce is fraud, but claiming you can develop something if you have the money and then failing to is the risk of investing. Doubly so if it's something that a vastly inferior version can be thrown together with available parts. 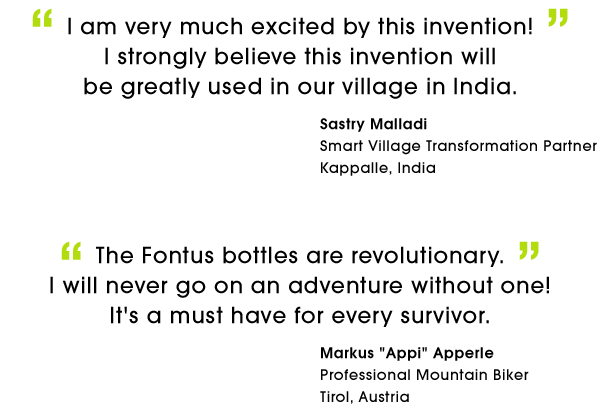 I'm pretty sure the Fontus bottle won't work as claimed when it is shipped in April next year. It's probably a scam or some project by a bunch of clueless people. The most you guys can do now is to share the contents of this page on social media and help make it viral. I've done my part and posted in about two dozen pages warning people of Fontus. I've stopped posting because I don't want Facebook to suspend my account for spamming. It's particularly heinous that they allow Fontus and Watly to "share" the same space. Watly is about a lot of things, one of them is purifying water for poorer than poor communities for 15 years, running on Solar Power. They claim to be able to purify 5000 liters of water per day using polluted water as the source. They also have the central part of the structure covered with solar panels to provide the energy to the whole system. Now compare that with the small Fontus bottle Lid creating 12 liters of water per day. 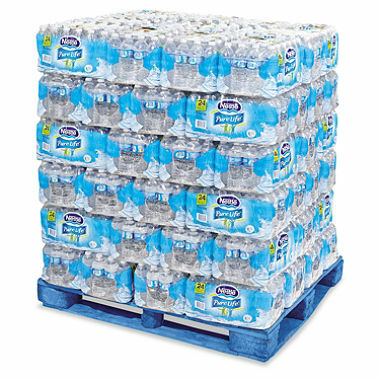 You would need 417 Fontus bottles to produce the same amount of water ... out of thin air ... Actually, you would only need the lids, but ok. This is what 400 Fontus placed together would probably look like. Now, compare the two technologies. Watly "produces" potable water from polluted water using a small building size structure. Fontus "produces" potable water from moisture (thin air) using a pallet size structure. That's how revolutionary Fontus claims to be. One wants to provide water in central Africa for families survival. The other wants to give free water to middle class bikers. One is being backed for $18K so far (only a couple of days) and the other is being backed for $300K (little more than 1 week). And both share the same space in Indiegogo. Some of the comments in this forum are accurate and valid. However, many are not, and some are just toxic. We always appreciate people with questions about our project coming directly to us instead of taking their own closed conclusions. This makes a discussion fair. Unfortunately, there are such a wide variety of disparaging responses that we wanted to address a specific group of individuals. While this information is already listed and available online, it may have alluded some of you as to the proper framing of that information. 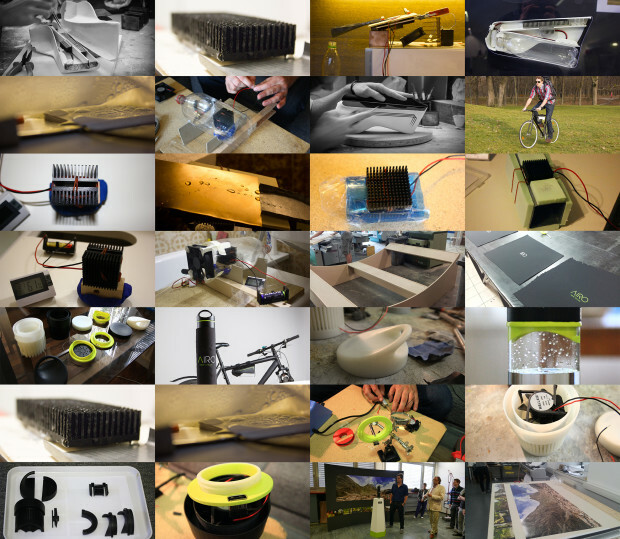 The Fontus project started as an industrial design exercise at the university of Applied Arts in Vienna. The concept is one that has been around for thousands of years in various forms, ours was to modernize it. Originally, the calculations for the water gathering rate at optimum conditions, were just that - calculations. However, at that time the focus was time was not on the technology itself - more of the design and concept. This is a very important fact that is being overlooked, that input data parameters from the initial concept will not be representative of the final products that you will be getting. So all you academics can relax the math muscles for now! Fast forward to now and after almost two years of no activity, the product idea and concept got shared over social media and became viral without intention or effort. It has been mentioned that one culprit of this is the video quality, which then could have lead some people to think it already existed at a production level. While we would very much like that, this is not the case! However, due to the surge in popularity - we decided to leverage the momentum and launch crowd funding a bit earlier than planned. Various high level institutions support the idea and believe in the need to develop an innovative technology that combines different techniques of harvesting water from the air with low energy input (this includes the austrian government that is officially supporting Fontus with funds, we are working in cooperation with the technical university of München, Germany, we have been selected as international Top 20 for the James Dyson Award where projects go through thorough examination by an engineers team, we have won several design awards including Gold for the International Design Award and we have been featured by serious press such as the TIME magazine, Focus, Der Standard, ORF2, engadget, the huffington post, etc). Until we have the final design and manufacturing process patent - we aren't going into specifics. Since then the Fontus team has entered the development cycle earlier and partnered with key testing and production partners to accelerate the product launch. Again, the graphics and images shown at our crowdfunding campaign are partly based on very first experiments and serve merely for illustrative purposes. We clearly state this on our campaign site. Input values shown will not be indicative of the final product tested. The input parameters are being optimized to get the best performance and will be published with test data once the labs have completed their test phases. Once the operating range and water generation rates are finalized based on atmospheric conditions, we will be relaying that to our early adopters. So while we recognize the collective need to get this solution to market for the betterment of all, we are rising to the challenge to launch Fontus sooner than planned. There will always be bumps in the road, and we will continue to attack them with the same out of the box innovation that makes the Fontus products unique. Once the operating range and water generation rates are finalized based on atmospheric conditions, we will be relaying that to our early adopters. But that's after you have spent their money, right? First development stages and early testings are being already financed by the austrian government. So? Will the IGG supporters be able to get a refund when you finalize the water production rate of the actual unit? IGG supporters are mainly supporting development and preparing products for production. All information is on our campaign site! They think they are getting a useful self filling water bottle. Is that incorrect? Dear Mick, we clearly define the status of our company and the status of our products on our site in text, graphic (see timelines 1&2) and video. A crowdfunding campaign is not an online shop! Reward based crowdfunding is by definition support in form of donations from the crowd to come up with whatever costs an organization or person with a great idea need to make this idea become real. This is a very important fact that is being overlooked, that input data parameters from the initial concept will not be representative of the final products that you will be getting. OK, so you use the data just to lure investors, making them believe that they could get a bottle harvesting ½ liter of drinking water in 120 minutes at 30% humidity (that's about the humidity on Sahara desert), just to use their money to make your calculation correct and tell them that in fact they cannot harvest more than perhaps 10 milliters (in reality likely even less). And that they will need solar panels of 2 or 5m² instead of the tiny PV sheet. Why do you need so much money to get the trivial calculation at least approximately right? It would not take you more than 10 minutes of work. Check my post #5 if you want to get some idea. Being an expert, you can certainly do it even better. There is no reason to willingly deceive investors by publishing impossible data - and you know very well that the data you published was absolutely misleading. How else than by criminal intent would you explain the claims (see your own graphics below) that the bottle would harvest ~900 ml at 90% humidity in 120 minutes, and 500 ml at 30% humidity? And yes, misleading investors is a criminal intent. So you have no plans to ship anything to the backers? Why on earth would you conclude that? In my opinion this forum is pure provocation. We need to focus on working towards our goals. We could talk again in a year when we ship our products. Peace! Why on earth would you conclude that? I did not conclude it, I was asking you. 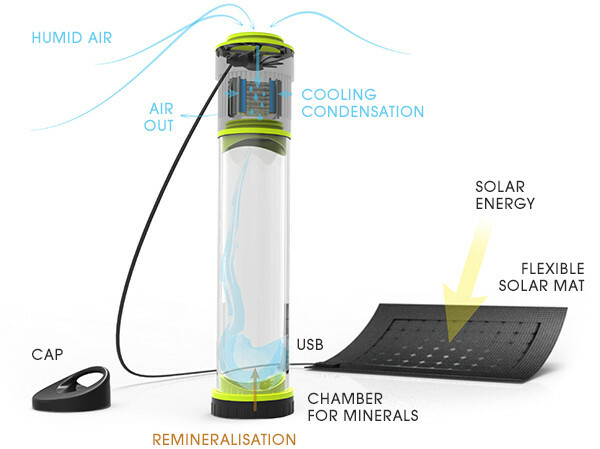 So can you guarantee that the backers will get a solar powered water condenser (of uncertain efficiency) fitted to a bottle? we are working in cooperation with the technical university of München, Germany, we have been selected as international Top 20 for the James Dyson Award where projects go through thorough examination by an engineers team, we have won several design awards including Gold for the International Design Award and we have been featured by serious press such as the TIME magazine, Focus, Der Standard, ORF2, engadget, the huffington post, etc). Until we have the final design and manufacturing process patent - we aren't going into specifics. 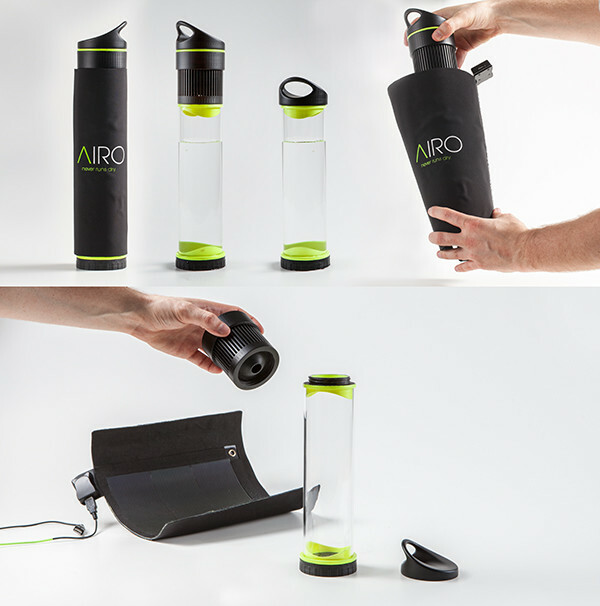 IRVINE, Calif., April 5, 2016 /PRNewswire/ -- Patent Pending & developed by industrial designer Kristof Retezár at the University of Applied Arts in Vienna, FONTUS aims to be the world's first product development company geared toward building self-filling water bottle systems. This states that there is a patent pending. Could you please tell us where the patent was filed, and under what name? (Or the filing number?) If a patent has indeed been applied for, then there is no need for secrecy: that is kind of the point of patents! Again, the graphics and images shown at our crowdfunding campaign are partly based on very first experiments and serve merely for illustrative purposes. I assume that the graphics and images shown at your crowdfunding campaign are based on these experiments. Am I right? Can you then explain how exactly one drop of water per minute morphed into 1L/hour? Were the drops really 17 milliliters huge? Google Convert tells 60 drops = 3ml (or 0.6 US teaspoon). Or did you simply multiply the data from the test by the factor of ~300, so that it looks better to the investors in the crowdfunding campaign? Deceiving "merely for illustrative purposes", as you tell.